Max, the military dog we first met in the movie Max (2015), is on loan to the White House to help with a state visit. 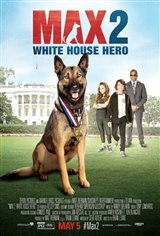 Although Max is assigned to security detail, he wanders off and meets the President's 12-year-old son, TJ Bennett (Zane Austin), who immediately falls in love with the dog. His father (Lochlyn Munro) decides Max should become a companion to TJ. When the Russian President (Andrew Kavadas) and his daughter, Alexandra (Francesca Capaldi) visit, TJ befriends her, but they soon discover someone is looking to hurt both of their families. Only Max has the skills to keep them both safe and uncover the evil plot.